This post is still part of the KoreaBuys series that I got a few weeks ago. If you remember I got three different products from KoreaBuys and I have reviewed two of them (the Etude House Real Art Cleansing Oil & Etude House Shinee Be My Princess Perfume Mist). Now it's time to review the last one from the bunch! I'm sure some of you have heard or tried this product before because this is actually an old time favorites from Tony Moly. I remember it's always sold out whenever I want to buy it, maybe because the super cute packaging makes them very popular. 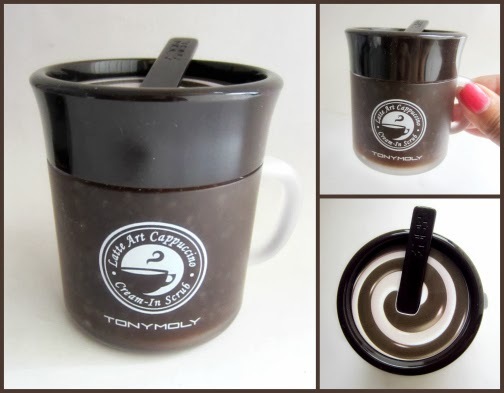 This Tony Moly Latte Art Cappuccino Cream-In Scrub is a coffee-scented face scrub that comes in a unique coffee / cappuccino cup! 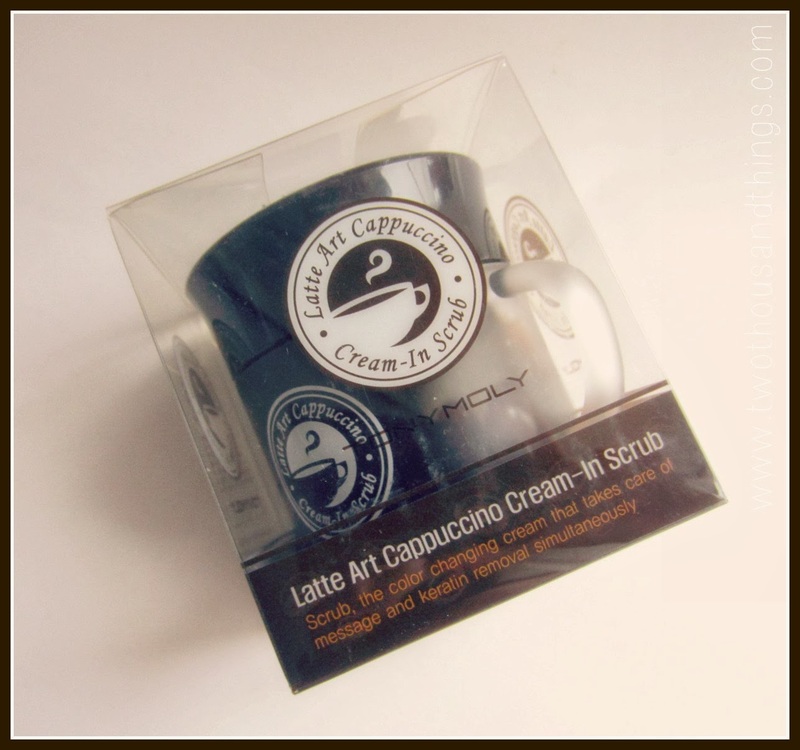 You might noticed that this probably looks different because Tony Moly seems to re-packaged this product currently, so it might look different with the old Latte Art Cappuccino Scrub that you might have seen around. This one has a clear glass-lookalike container with swirly white/brown pattern on the lid that represents a creamy cappuccino in a glass. It also has a little spatula that were disguised as a "spoon" that were tucked inside the lid ;p - This is the cutest face scrub packaging I've ever seen so far, and that is the number one reason why I wanted to get this product at the first time. I'm a sucker for everything that has cute and unique packaging. 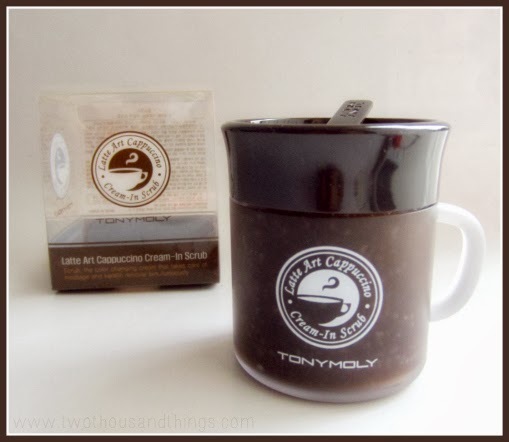 According to the information on the box, this Tony Moly Latte Art Cappuccino Cream-In Scrub is a color changing-cream that functions as a scrub by massaging it on to the skin. It contains active ingredients of coffee and milk extracts which works to remove dry, flaky dead skin cells, as well as impurities from the skin while providing nutrition to the skin. The warm sensation produced when rubbing the scrub on the face along with the color-changing scrub removes impurities deep in the pores. The tiny grains within the scrub makes the skin smooth and glossy, as well as adding firmness to the skin and slim the facial contour of the face. First of all, I really love the packaging (of course I do!). 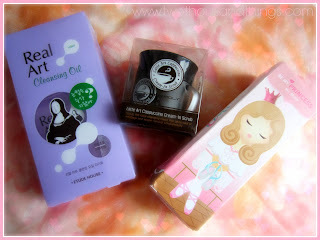 Tony Moly is one of the popular Korean brands that always makes products in the most cute / unique packaging. 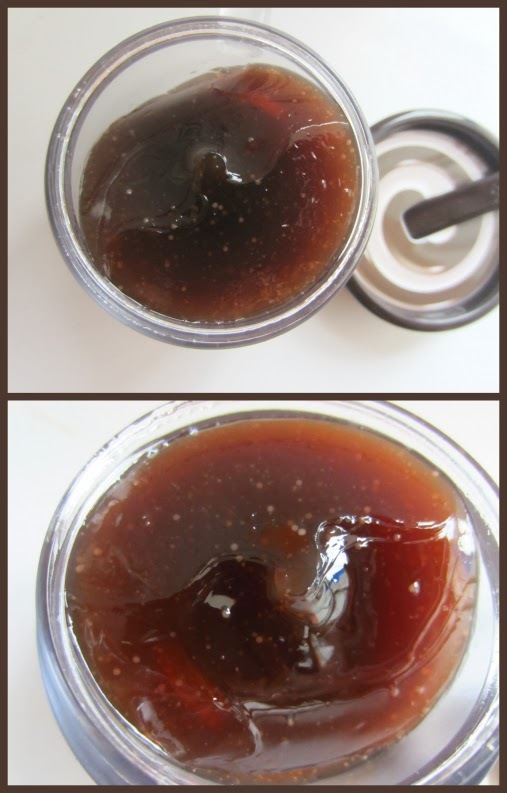 You can see from above photos how cute is this face scrub is. The actual size is small, almost the size of my little hands/palm. But the product inside is packed full to the brim of the container. It's not actually made of real glass, but it was made to look like a glass cup. From the transparent container you can see that the actual product has a deep brown color with some granules mixed in. Once you open the lid, the product looks like above photo. Remember that I mention about the little spatula that was tucked inside the lid to represent a "spoon" to stir the coffee? You can see the spatula on above photo too. I love scrubs that include spatula in it so that it would be less messy and more hygienic to scoop out the product from the packaging. So this is a plus point for me. This smells like milk coffee indeed. I love coffee and I also enjoy the scent of coffee, so I would almost automatically buy any product that has coffee scent to it, LOL. The coffee scent in this product is not strong so you can only sniff it from the packaging. 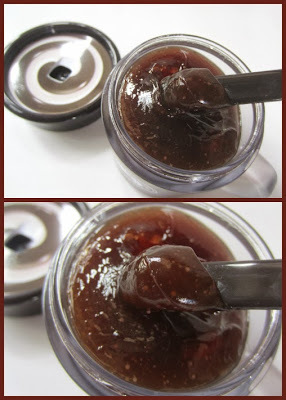 It felt nice on the skin and I would feel the warming sensation upon applying it to my skin. The warming sensation means that the product is working. The warming sensation is something unusual indeed and I actually enjoyed it after the 2nd use. The warm feeling would not last long and will be gone in a few minutes. If this is your first time using this kind of product then you will only have to just get used to it. Don't worry it's not hot or burning, it's just a nicely warm feeling. I like to spread it on my whole face and neck area, and then scrub it off slowly and gently. The scrub is not abrasive at all so you won't feel any hard scrubbers at all, but once you rinsed it all off you would find a clearer skin with moist and plumped feeling all over. Once you massaged the scrub on your face it would slowly turned from dark brown color to a pale brown (almost white-ish) color. After that, I would wash it all off and pat dry my face, and then continue with my usual moisturizer. Overall, I like using this non-abrasive soft scrub once a week to get rid of those dead skin cells and dry patches, as well as other impurities on my skin. When used regularly, this face scrub can bring a lot of benefits to our skin. I think this would be good for any skin type because the formula is not too heavy / thick and is quite friendly to the skin. If you prefer a non abrasive face scrub or if you have sensitive skin then you might also try this one.